With 14 extant species (see table), the genus Tenomerga is the largest among Cupedidae and Archostemata in general. 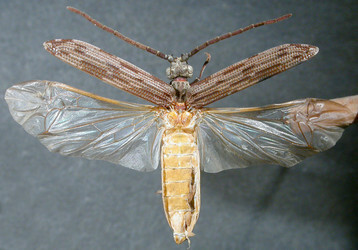 Species of this genus are found in North America (T. cinerea) and South Africa (T. leucophaea) but most species occur in the south-east Asiatic area. The species of Tenomerga are characterised by short, compact heads with usually distinct posterior dorsal head tubercles. 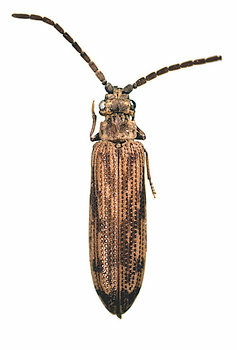 The different species can grow in total length from 7mm up to ca. 20mm. The phylogenetic relationships of the species of Tenomerga were analysed by Hörnschemeyer (2009). 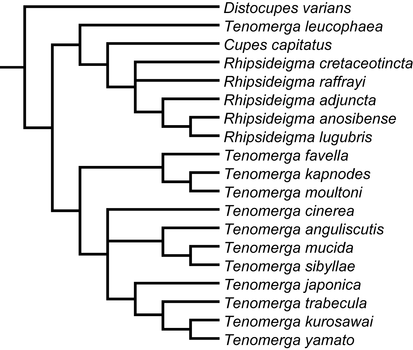 An interesting result of this analysis is the postulation of a close relationship of T. leucophaea with Cupes capitatus and Rhipsideigma, rendering Tenomerga in ist current designation non-monophyletic. Such a relationship becomes plausible when Tenomerga fossils from Europe are taken into account. Motschulsky 1856, Peyerimhoff 1909, Gersdorf 1976, Tröster 1993, Wedmann 200 and Wappler 2003 described compression and amber fossils of Eocene to Pleistocene age from Europe that closely resemble C. capitatus as well as T. leucophaea in their character composition. Otherwise the species of Tenomerga are grouped in two clades, one comprising the North American T. cinerea and the eastern Asiatic species (see cladogram), the second clade contains T. favella, T. kapnodes and T. moultoni. Casey, T. L. 1897. Coleopterological notices VII, Cupesidae. - Annals of the New York Academy of Science 9: 637-638. Chevrolat, A. 1829. Iconographie du Règne Animal - In: Guérin-Méneville, F. E.: Iconographie du Règne Animal, Vol. 3: 58. Ge, S.-Q. and X.-K. Yang. 2004. Two new Chinese species of Tenomerga Neboiss (Coleoptera: Cupedidae), with a world catalog of the genus. Proceedings of the Entomological Society of Washington 106(3):631-638. Gersdorf, E. 1976. Dritter Beitrag über Käfer (Coleoptera) aus dem Jungtertiär von Willershausen, Bl. Northeim 4226. - Geologisches Jahrbuch A 36: 103-145. Gestro, R. 1910. Contribuzione allo studio dei Cupedidi. - Annali del Museo civico di storia naturale di Genova 4: 454-456. Klapperich, J. 1950. Eine neue Art der Cupesidae (Coleoptera) aus Asien. - Bonner Zoologische Beiträge Heft 1: 83-85. Kolbe, H. J. 1886. Beiträge zur Kenntnis der Coleopteren-Fauna Koreas. - Archiv für Naturgeschichte 52: 139-240. Melsheimer, F. E. 1845. Descriptions of new species of Coleoptera of the United States. - Proceedings of the Academy of Natural Sciences of Philadelphia 2 (12): 302-318. Miyatake, M. 1986. 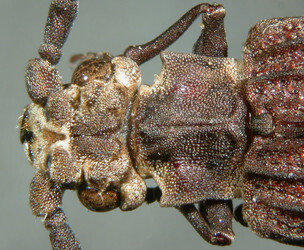 A new species of the genus Tenomerga (Coleoptera, Cupedidae) from Yakushima Island, southwest Japan. - In: Ueno, S.I. (Ed.). Entomological papers presented to Yoshihiko Kurosawa on the occasion of his retirement. Coleopterists‘ Association of Japan, Tokyo: 111-114. Newman, E. 1839. XXXV.-Supplementary note to the synonymy of Passandra. - Annals and Magazine of Natural History (Zoology, Botany, and Geology) 3 (18. 303 - 305. Pascoe, F. P. 1872. Notes on Coleoptera, with descriptions of new genera and species. Part 2. - Annals and Magazine of Natural History (4) 10: 317-326. Say, T. 1835. Descriptions of new North American coleopterous insects, and observations on some already described. - Boston Journal of Natural History Vol. I (1834-1837): 151-202. Solsky, S. 1871. Coleoptères de la Siberia orientale. - Horae Societatis Entomologicae Rossicae 7 (1870): 334-406. Tamanuki, K. 1928. A taxonomic study of the Japanese Cupedidae. - Zoological Magazine, Tokyo 40: 242-254. Tröster, G. 1993. Two new Middle European species of the genus Tenomerga Neboiss 1983 from the Middle Eocene of Grube Messel and the Eckfelder Maar (Coleoptera: Archostemmata[sic]:Cupedidae). Mainzer naturwiss. Archiv. 31:S169-176. Wedmann, S. 2000. Die Insekten der oberoligozänen Fossillagerstätte Enspel (Westerwald, Deutschland). - Mainzer naturwissenschaftliches Archiv Beiheft 23: 1-154. Westwood, J. O. 1835. Insectorum Arachnoidumque novorum Decades duo. - The Zoological Journal 5 (20. 440-453.